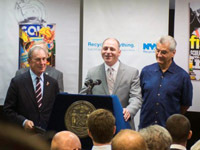 GrowNYC Supports City Efforts to "RECYCLE EVERYTHING"
GrowNYC is proud to support Mayor Bloomberg’s leadership in expanding recycling in NYC with the launch of "Recycle Everything." In 2006, the City created GrowNYC’s Office of Recycling Outreach and Education to assist their ambitious goals to divert more waste from disposal. Whether promoting textile, e-waste, and increased plastics recycling or working with the Department of Sanitation to establish organics recycling programs like those happening at Morningside Gardens (where this week’s press conference took place), GrowNYC is thrilled to be a component of the City’s efforts. The "Recycle Everything" ad campaign launched and the expansion of the City’s organic food waste recycling program shows how far New York has come in managing the 11,000 tons of waste generated every day. Together, these initiatives will help double our recycling rate by 2017 and reduce the amount of trash sent to landfills. GrowNYC was proud to help establish the Morningside Heights organics collection and will promote the City’s Recycle Everything campaign in its education outreach across the five boroughs. 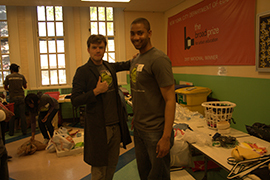 Read more about GrowNYC Supports City Efforts to "RECYCLE EVERYTHING"
Since 2007, GrowNYC’s Office of Recycling Outreach and Education has been hosting community swap events to reduce waste and engage residents in the practice of reuse. Stop ‘N’ Swap® helps keep good things out of the landfill by bringing together people with good things they no longer need and those who can use those items. We have held 47 swaps so far, serving nearly 12,000 New Yorkers. With the addition of two new staff dedicated to our Stop ‘N’ Swap program, we aim to dramatically increase access to these events. Meet TK Zellers and Carl-Harry Nau, the team working to bring a swap to each of the city’s 59 Community Districts each year. CHN: At a Stop ‘N’ Swap you have a diverse group of people show up all looking for something new to add to their life. Interacting with the folks at the swap is fun because you get a sense of who they are and why they are here, and I get to see cool new stuff. TKZ: Telling people who’ve never heard of Stop ‘N’ Swaps about what they are and what we do. There’s always a moment of disbelief, and it sometimes takes some convincing to get people to believe that, for instance, ‘it’s totally free!’, but in the end everyone I talk to is impressed, happy, and excited to get swapping! I’ve even got some high-fives, and one hug so far. Have you always been inclined to reuse things? CHN: I grew up in a house with two brothers and both my parents working their tails off to pay rent. So it was safe to say things like clothes, cell phones, video games, and toys were passed down from one child to the next. I even took some items that my friends no longer wanted. Reusing is second nature. TKZ: I always liked the idea of repurposing things for more creative uses. Every gift I gave anyone until about the age of 16 was handmade out of old papers, cans, bottles and duct tape. My artistic talent didn’t ever live up to my aspirations, but it’s the thought that counts, and ugly or not, that soda-can-picture-frame stayed out of the waste stream! What are some of the reactions you get when bringing a swap to a community for the first time? CHN: People usually ask whether we’ll be back the next week, or when we will return to the neighborhood. Swaps receive a warm reception from those who grasp the concept of what we do and they also conjure feelings of regret by those who pass by and realize what they missed out on. Does the swap change from neighborhood to neighborhood, or is it relatively consistent? CHN: I have noticed the items that are swapped change from location to location. Some areas have more books, others have more house wares, and some areas have more children’s clothing. The Stop ‘N’ Swap volunteers are pretty incredible. What keeps them going? Do you stretch before the event? CHN: I want to say we have a great staff that works alongside the volunteers at each event. The staff leads by example and takes an “All Hands On Deck” approach during all aspects of the event. We also care for the opinions and concerns of our volunteers and take care to assign them to appropriate tasks. I will say stretching is not a bad idea! TKZ: We haven’t come up with a Stop ‘N’ Swap calisthenics warm-up routine yet, but we do make sure to supply everyone with plenty of food and coffee before and after. I think a big motivator is how much fun Swaps can be. You never know what you’re going to find at the sorting table, and impromptu fashion shows and ‘what-is-this’ guessing games are common. Everyone manages to have a good time while helping hundreds of people find a new home for thousands of pounds of good, reusable stuff. What is one of your favorite swap moments? CHN: At our Upper West Side swap I spoke with a woman who came to gather items for her friends at a nursing home. She said that she had the ability to leave the facility and she knew that the others would have relished the opportunity to attend. Later I was asked by someone from the neighborhood what items people like to take at swaps and I told her sometimes people come looking for items to help others, such as the woman from the nursing home. At that point I created a connection between them and the lady who lived in the area left and returned with 6 new walkers, which went back to the residents of the nursing home. What do you hope people take away from the experience? CHN: I hope they understand that everything they own has value, and even though they may no longer need the item that someone else can use it. I hope the joy people get from the items they find encourages them to continue to participate and bring their unwanted items so that they can have a second life. TKZ: Besides a few pounds of reused items, I hope people leave Stop ‘N’ Swaps with a newfound respect for reuse, and a curiosity to find out more about using and wasting less. There are so many resources to help people figure out ways to repurpose, repair, recycle or reuse anything we might otherwise just waste. GrowNYC and Stop ‘N’ Swaps are a great place to start! On Wednesday, July 17, Greenmarket will celebrate its 37th anniversary, and we’ll be partying into the night at Union Square Greenmarket’s first ever night market. In collaboration with Manhattan Borough President Scott M. Stringer’s office, as well as over 15 neighborhood restaurants, the market will offer the same great summer bounty customers have come to love and rely on through the decades, alongside prepared food, live music by the Blue Vipers of Brooklyn and beer courtesy of Brooklyn Brewery. Watermelon are officially in season, as are green beans, corn, okra, peaches and apricots. Fill your shopping bags and dine on summer fare while reveling under the stars at this Manhattan institution. It’ll be a party for all ages-- we hope to see you out there! This spring, GrowNYC’s Recycling Champions Program held a recycling contest amongst schools in the program to see which school could achieve the highest recycling rates. 22 schools participated in the six-week long "Big Lift"– where schools once weekly weighed the recycling and trash from classrooms, offices, and the cafeteria. With an overall recycling rate of 54%, P.S. 154 in Queens was the grand prize winner! P.S. 154 increased their recycling rate by 268% and reduced the amount of trash by 46%. Other top winners include: P.S. 29 Brooklyn and the High School for Law and Public Service in Manhattan which improved recycling rates by 146% and 88% respectively. P.S. 25 Bronx had a 47% overall recycling rate – 20% for metal, plastic, and cartons. As a result of their outstanding recycling rate, P.S. 154Q won a school greening package valued at $2,000! The prize included tree mulching, park benches made from recycled plastic and a new school garden. On June 25, students and faculty worked alongside staff from GrowNYC to construct the school garden and assist with tree mulching. For many students, it was their first experience with hands-on landscaping and gardening. Students filled the bed with top soil and planted a number of perennials and herbs that will attract butterflies. In addition to beautifying the school, the 8' x 3' raised bed constructed from recycled lumber, will serve as a valuable educational tool for students to learn about the natural environment.